Schold Robbins Wedding - BrainstormOverload - Small design studio. Big ideas. 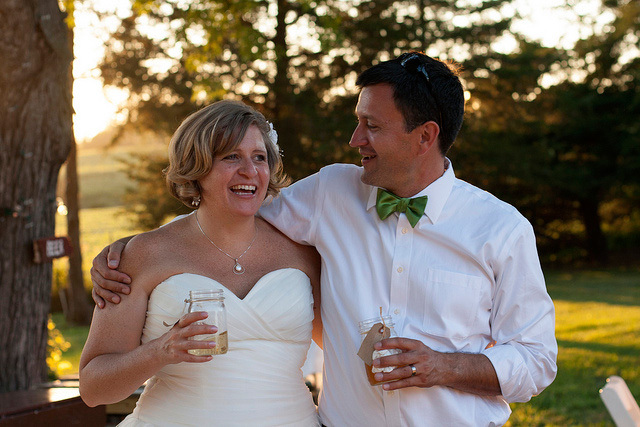 Krista and Jon were married in Story City, Iowa. It was the perfect opportunity for a wedding invitation that literally tells their love story. 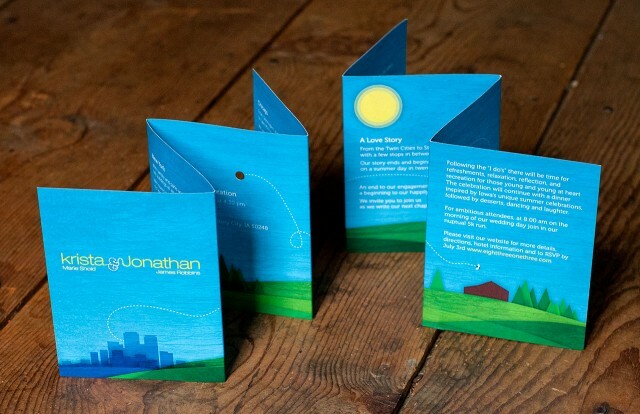 Our design uses the front and back of the invite to chronicle their travels around the world together. The bumble bee who’s flight path formed the ampersand on the original save the date card leaves Minneapolis, MN and flies through a hole in the second panel where it follows Krista and Jon’s adventures. The bee returns through another hole in the third panel to complete it’s journey to Story City. Invitation front and back. The visual theme started with an earlier save the date card, included header art for a website, and ended with the wedding program. The wedding was lovely, loads of fun and an excuse to take a few photos.